The Cleveland Browns have made the firings of Hue Jackson and Todd Haley official and have also made the promotions from within the remains of the coaching staff. 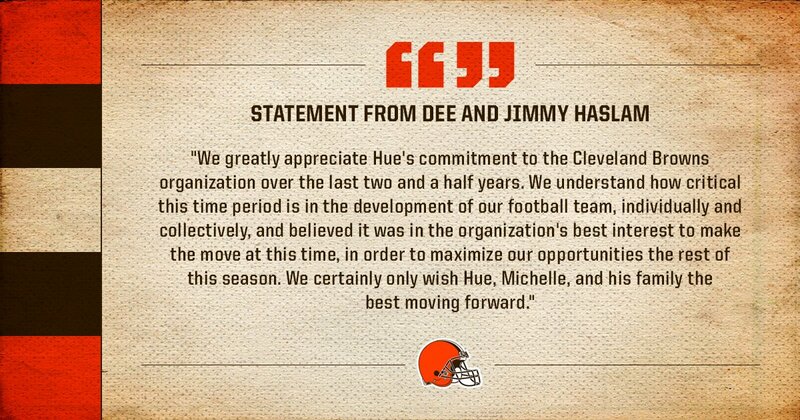 First, the team released a statement from owners Jimmy and Dee Haslam. The team announced that defensive coordinator Gregg Williams has been named the interim head coach and running backs/associate head coach Freddie Kitchens has been named the offensive coordinator. Haslam and general manager John Dorsey will meet with the media on Monday afternoon at 4:30 p.m.
Williams has been the defensive coordinator of the Browns since the beginning of the 2017 season. After being the 31st ranked defense in terms of points allowed, through eight games this season, it’s been elevated to 24th giving up 26.3 points per game. They’re number one in takeaways with 22 (13 in 2017 season). He has head coaching experience, having coached the Buffalo Bills from 2001 to 2003. His record was 17-31 including an 8-8 season in 2002. Williams has been in the NFL since 1990, mainly as a defensive coordinator with the Oilers/Titans, Redskins, Jaguars, Saints and Rams. I don’t think people were considering him as a interim coach because of his reputation around the NFL following the “Bounty-Gate” scandal that took place during his tenure with the Saints where the defense under his leadership were placing bounties on players, specifically quarterbacks such as Brett Favre and Kurt Warner. Obviously he’ll only be the interim coach and unless the Browns have a major turnaround in the second half of the season, he won’t be the long-term head coach for the organization. Kitchens has never been an offensive coordinator at any level of football but he has called one game as a play caller. Former Browns offensive coordinator Todd Haley had a tradition of letting one of his assistants run the offense in the final preseason game and Kitchens got that honor in the preseason finale earlier this year against the Detroit Lions. The former Alabama Crimson Tide quarterback has coached tight ends, quarterbacks and running backs in the NFL since 2006 when he started with the Dallas Cowboys. He spent 2007 to 2017 with the Arizona Cardinals in a variety of roles before coming to Cleveland as the running backs coach and associate head coach. These final eight games will obviously be a audition period for Kitchens who could latch on with another team following this season as an offensive coordinator if he performs well in the interim.